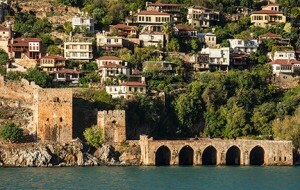 Alanya is today a beach resort city on what some call the Turkish Riviera, with about 250,000 people in the region. We arrived at dawn to a beautiful morning. Clouds and rain storms followed, but somehow we managed to avoid them as we explored the region. The city is on a small peninsula that juts out into the Mediterranean Sea below the Taurus Mountains. Because of that defensible location, Alanya has served as a fortress or stronghold for many peoples, including Ptolemaic, Seleucid, Roman, Byzantine, and Ottoman Empires. Finds in the nearby Karain Cave indicate occupation during the Paleolithic era as far back as 20,000 BC, and archeological evidence shows a port existed at Syedra, south of the modern city, during the Bronze Age around 3,000 BC. 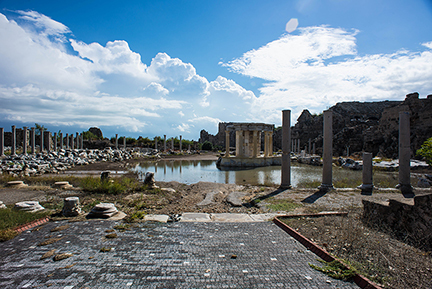 The Roman Republic fought local Cilician pirates in 102 BC. 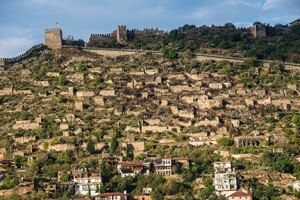 After the fall of the Roman Empire, the city remained under Byzantine influence. 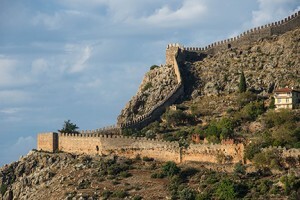 Islam arrived in the 7th century with Arab raids, which led to the construction of new fortifications and periods of back-and-forth between Byzantine and Seljuk control. The Seljuks renamed the city Alaiye, a derivative of Sultan Alaeddin Kayqubad I’s name. Fast-forward to 1935 when Turkish ruler Mustafa Kemal Atatürk came for a visit. As part of Ataturk’s modernization of Turkey, he decreed a change from Arabic and old Turkish alphabets and adopted the Latin script. 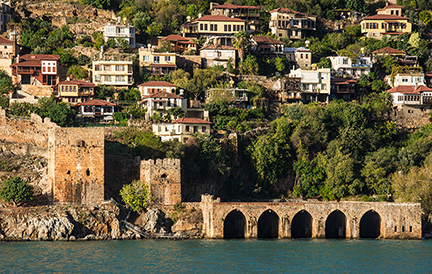 According to legend, a mistake in a telegram to Ataturk resulted in changing Alaiye to Alanya, and that is the name we have today. Local cuisine is built around seafood, including sea bass, red mullet, and other fish. Turkish ice cream is always a treat; here local flavors include peach, melon, mulberry, and pine resin. 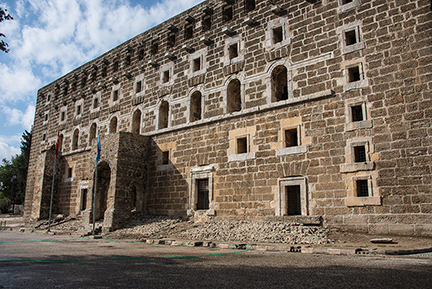 The Kızıl Kule or Red Tower stands at the harbor below the castle. 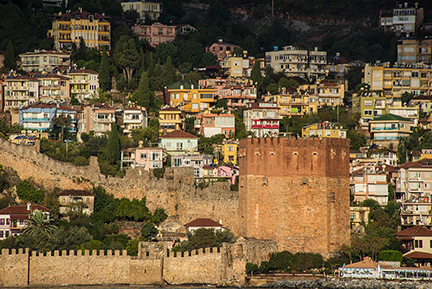 The last of Alanya Castle’s 83 towers, it was built to protected the Tersane (dockyard), one of the finest examples of medieval military architecture still in existence. Built by the Seljuk Turks in 1221, the dockyard has five vaulted bays. 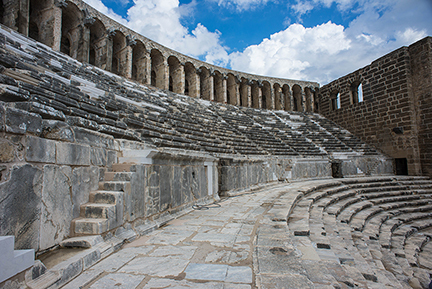 About 90 minutes away from Alanya are the impressive remains of two great Greco-Roman cities: Aspendos and Side (pronounced SEE-deh). The theatre at Aspendos is one of the larger nearly intact buildings of two millennia ago. 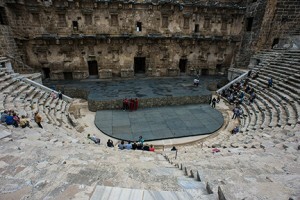 And the theatre at Side overlooks the remains of a once-great seaside city. All photos by Corey Sandler, all rights reserved. 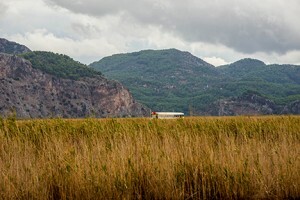 If you would like to purchase a high-resolution copy of an image, please contact me. 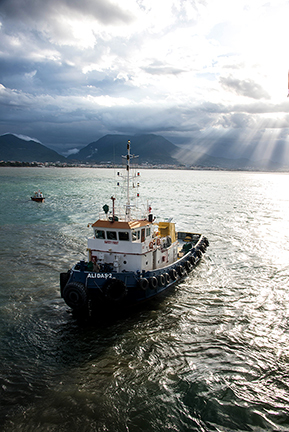 We sailed into the dramatic harbor of Marmaris is the predawn darkness and then saw that even with the sun above the horizon the skies were dark and threatening. I consulted the maritime weather forecast, full of details about satellite imagery, barometric pressure, and reports from throughout the region and as a modern human I was convinced that we were in for a 100 percent chance of a dismal day. By the end of the day, I was convinced that life 4,000 years ago had been so much simpler. Forget about Accuweather and fancy scientific tools. 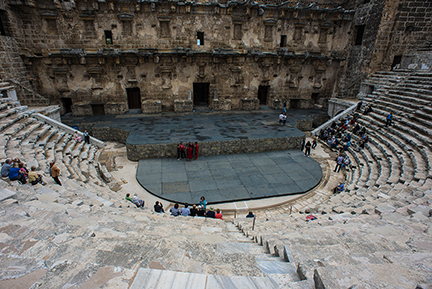 I love animals, and I’m not about to sacrifice a goat (or a cat–of which there were thousands wandering about–but I did bring an umbrella and a raincoat and a box full of disposable ponchos for the guests. And because of all that preparation, we were treated to a bright and mostly sunny day. 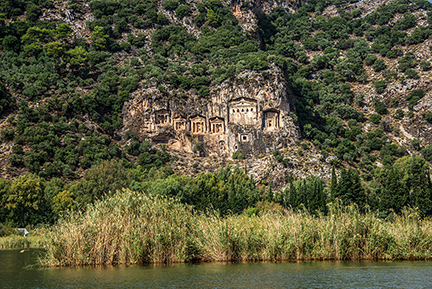 About an hour away is the town of Dalyan, and the rock tombs near Caunos. 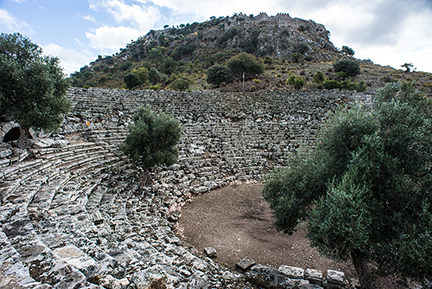 At Caunos you can see Hellenistic fortifications, remains of tower and a gateway on Acropolis Hill, a Palaestra, Theatre, and Byzantine Church. 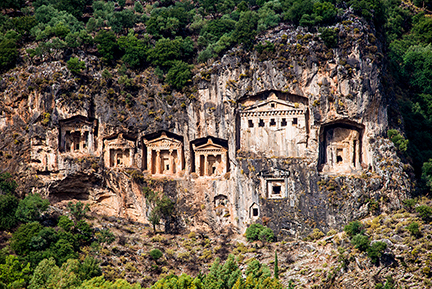 And most dramatic, a set of tombs carved into the rocks near the town. All photos by Corey Sandler. All rights reserved. If you would like to purchase a high-resolution copy, please contact me.